"Raddi" is the colloquial Indian word for old newspapers, plastic bottles, metallic cans and things of that ilk which people either throw out or sell to a 'raddiwala' (collector) to be recycled, and get a paltry sum of money in return. 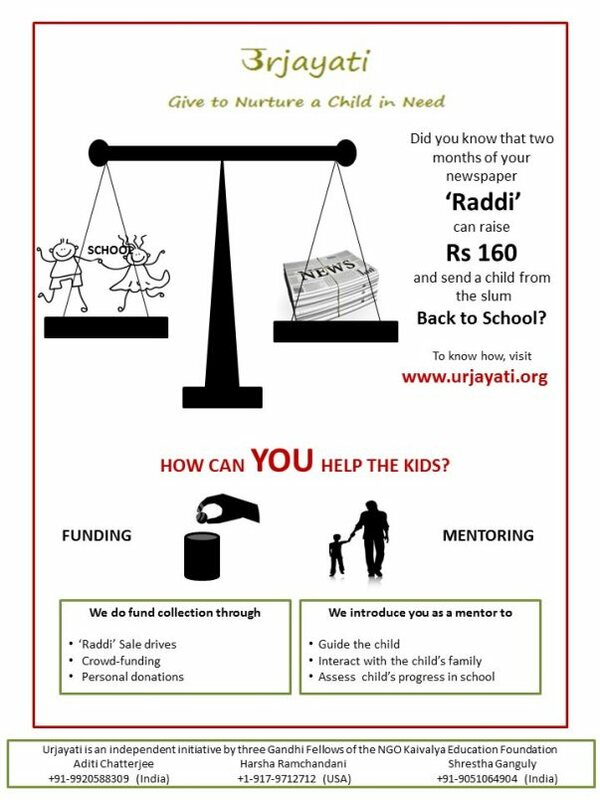 And that's what we did with our volunteers for our first fundraiser - we collected 'raddi' as donation from households and sold it to raise money for our initial kitty, with which we started the process of sending 8 kids from the slums of Mumbai back to school. And that's what Project Urjayati is all about - financially sponsoring slum children from disadvantaged backgrounds to go back to school, and mentoring them to ensure they don't drop out. All this to help them get an education, instead of getting pushed into child labour. WHO ARE WE? AND WHY ARE WE DOING THIS? Project Urjayati is an independent initiative by three Gandhi Fellows. We are three women in our mid-twenties who, till a few years back, were immersed in college degrees, foreign exchange programs and corporate jobs with MNCs. From 2014 though, we spent two years working with 32 municipal schools and their surrounding slums in Mumbai and Thane, with the NGO Kaivalya Education Foundation. We have each spent a month living in the slums of Mumbai with the children we work for. 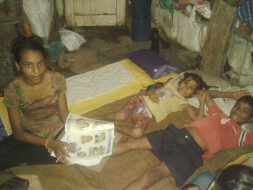 We have also spent a month each working at labour jobs with the parents of these children. All of this, so that we could understand their problems and help in our own small way. In our experience with kids from the municipal schools and slums in Mumbai, we noticed that many children from low-income families drop-out of school. Or don’t go at all. Or try to manage work and school together and compromise on their education. Often they are in this position because they have to work to support their families. Or look after a sick relative or younger sibling while the parents are at work. Or simply because they cannot even afford the monthly transport cost if the school is far away. For instance, take the case of Ronti. 15-year old Ronti Sarkar was the topper of his school in Class 10. From there on, his education now takes up 50% of his family’s income. Not because it costs that much, but because his family earns that little. Despite their best efforts. With the help of our donors, the mentors, and a number of very kind volunteers who have helped us in every imaginable way, Project Urjayati has been making sure that kids like Ronti don’t have to forgo their education because of dire financial conditions at home. In the last one year, we have gone from supporting 8 kids in Mumbai to 22 kids from the slums of Mumbai, Delhi and Kolkata. We hope to be able to take on more with support from those who believe that every child should get the opportunity to study – without having to worry about how to pay for the books they need, or the fees in school, or the bus they need to take so that they don’t have to walk an hour to get to school every day. HOW MUCH FUNDS ARE WE TRYING TO RAISE? We customize our funding options for each child, to cater to their specific needs. One child might need as little as INR 200 (approx. US$ 3) per month, while another might need as much as INR 2000 (approx. US$ 30) per month. In order to continue supporting our existing kids from last year, and to take on at least 10 more this year, we are aiming to raise INR 192,000 (approx. US$ 2,880) for the next academic year. Halfway through last year, in May 2016, Milaap visited the slum to follow up on our project, and published this article in The Better India Blog - Link to Article in The Better India Blog. Thank you for all your support, we are being able to close one more academic year of education for all the kids at Urjayati! Not just that, one of the kids is preparing to appear for his engineering entrance exam in a few months from now. Another has taken up Economics in Class 11 and wishes to pursue it further. More details to follow by the end of this session in our annual newsletter to all of you. Please go to sleep tonight happy, knowing the huge difference you have made to the lives of these kids and their families over the past one year. P.S. If you are donating anonymously, please drop us an email at contacturjayati@gmail.com so that we can keep you posted about the progress of the kids. Refer to our Facebook post for updates about the children you have been supporting - this would not have been possible without your help, thank you so much! Please do share this campaign further with your friends and family. Last year we ensured 8 kids went back to school despite the event of a fire razing down their entire slum. This year, as the new academic year starts, we are narrowing down on 15 more kids - 10 in Delhi and 5 in Mumbai. In addition to the funds we have from our first round of collection, we are trying to raise Rs 35,000 more, as fees for these new kids varies from Rs 2000 per month to Rs 5000 per year. Help us raise the fund and send more kids back to school!